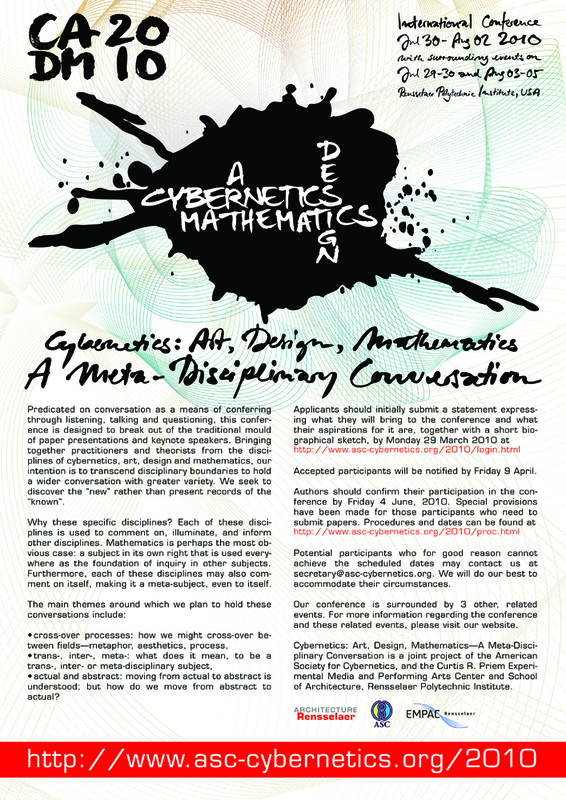 Cybernetics: Art, Design, Mathematics — A Meta-Disciplinary Conversation (C:ADM2010) is a public conference to be held at Rensselaer Polytechnic Institutes (RPI) new Curtis R. Priem Experimental Media and Performing Arts Center (EMPAC) July 30 to August 2, 2010. The conference is sponsored by the American Society for Cybernetics, EMPAC, and the School of Architecture, RPI. It is distinguished by 2 features. Firstly, the conference is primarily concerned with generating conversations about interactions among four subjects: Art, Cybernetics, Design, and Mathematics. Secondly, it is intended to promote conferring, and the pursuit of the next questions, rather than the presentation of the already known (for instance, in the form of papers). actual and abstract: moving from actual to abstract is understood; but how do we move from abstract to actual. What are the relations between models that are conceptual, computational and physical? How are their differences productive? recognize that these divisions are useful primarily as a guide for the conversation and a focus for writing. Conference members will divide into groups. Each group will appoint a moderator and rapporteur. Each day will end of the day with a facilitated plenary session at which each group will report back on their conversations in a further facilitated conversation. Papers will only be considered if they address one or more of these questions: that is, papers should address the themes of cross-over, meta and abstract/actual. Papers should address these themes in a way that is directly connected with the concerns of the author. The evening of 30 July will include conference registration, a welcome party, and a presentation by EMPAC. The evenings of 31 July and 1 August will be left free for impromptu events that arise out the day s conversations, or which are proposed by conference members. Participation in this public conference requires a fee. The conference will end on August 2 with a dinner in the evening (not included). There are 3 surrounding events. Before the public conference (July 29 to 30) there is a private meeting of the ASC. On the afternoon of 30 July there are introductory tutorials on the theme of recent developments in cybernetics. After the conference there will be a follow up workshop (August 2 to 5). There are no charges for taking part in these events. Application for a place in these surrounding events will open in the spring. Please watch this space for information.